The creators behind the #1 free strategy game(Lords Mobile) has just launched a brand new MMORTS game Madlands Mobile for mobile devices, even compatible with the latest Android version(Android Pie). The game is rich in terms of content, strategy, and graphics. If you have ever played other MMORTS games such as Last Shelter Survival, Rise Of Civilizations, Mafia City, and more, then you can easily master the Madlands Mobile. If you are having the problem understanding the game’s mechanics and looking for tips & tricks, then we are here to help you. In today’s post, we have covered everything about the game you need to know as a rookie: Madlands Mobile guide and Madlands Mobile tips, cheats & strategy to dominate in this game. Before we head to the main guide, tips, cheats & strategy part, let’s take a look at the basics first. In Madlands Mobile game, your objective is to build the strong turf(your base, where you build the facilities; production factories, vehicle factories, alliance facilities, and more). And how will you do it? By manufacturing the vehicles, upgrading the facilities(HQ), buildings), leveling up or rescuing the heroes, and researching. Additionally, looting the resources is your another main job. You use these resources to upgrade or buy buildings, in repairing or manufacturing the vehicles. As you progress in Madlands Mobile, your base will start getting attacks. Usually, when you start the game, the game protects your turf with a shield. This shield gets removed as you reach a certain HQ level. After it, enemies will be able to attack the enemies. Your job is to protect the resources from being plundered by the enemy vehicles or heroes. Similarly, you can also send the heroes(read the heroes guide below) to raid enemy turf and loot the resources. Now, let’s talk about the combat basics. The combat system is pretty simple. All you have to do is select the best heroes(usually, you can send up to five heroes on the march). Head to the world map; there you can see the enemy turfs, resources point, monsters camps, and more. In PvP fight, you raid other player’s base and loot the resources(except gold). And in the PvE battle, you fight against the monsters’ turf(Killdark camps, Firebug Camps, Shadow Camps, and more). From these battle, you earn resources, speed-ups, hero XP, Intel, bonus or buff activators, teleport items, gears, parts, and more. So that’s the basic Madlands Mobile guide for the beginners. Now, let’s head to the main Madlands Mobile guide and after it, check out our top Madlands Mobile tips, cheats & strategies to progress like a pro! In this part, we will learn about the heroes, skills, gears, buildings, vehicles, the game’s mechanics, battle guide, and much more. Make sure to pay attention to all the listed parts to learn everything. You lose the power when you lose the resources, vehicles in the combat. And you can increase the power by manufacturing bikes, trucks, cars, and helicopters. Additionally, pay attention to the heroes as they are the main characters in Madlands Mobile game. Main Buildings are HQ, factories, production centers, research lab, and the garage. The garage is where you can repair the vehicles, destroyed by enemies in the combat. Production centers produce resources. Factories, here you manufacture the vehicles. HQ is the core of turf. Without upgrading it, you can not unlock new features, buildings, upgrade heroes. At the research lab, you research the different types of technologies to boost combat/economy/heroes/defense. By researching, you can unlock farms, solar plants, raid high-level camps, increase the power of heroes, activate buffs, and increase the turf’s power. Resources are everything. If you have resources, you can instantly stand up even after the heavy attack. Initially, you have access to oil, metal, and gold. Additional ones are energy, food, coins, and alliance currency(crystals). And if add more in this list, we have Intel. The resources such as metal, oil, and more are used in upgrading, manufacturing, repairing. Coins can be used in the store to buy items such as Intel. Alliance currency can be used in the alliance store for items. And gold is a premium in-game currency, can be used in the store or in completing the work-in-progress buildings’ construction. The number of vehicles you can send in the battle depends on the hero’s capacity level. And the type of vehicle a hero uses depends on the type of hero. Additionally, the deal damage or defense by vehicles depends on the hero’s skills, gears. Indirectly, we can say that a powerful vehicle with a low-level hero is useless. And a powerful hero can strike down the enemies even with a low-tier vehicle. Let’s get started. Types of heroes: Car, Truck, Bike, and Helicopter. To add the car type hero in the combat, you need cars. Similarly, to add the truck/bike/helicopter heroes to the team, you need bikes, trucks, helicopters. On the main screen of Madlands Mobile game, at the bottom-right corner, tap the menu button(near world icon) -> tap the heroes icon. Tapping the hero icon opens the hero hall menu where you can see the list of heroes you have collected so far in Madlands Mobile game. Tapping the hero portrait will give you the details of the hero as well as skill/gear/XP-booster/intel options. On the same screen(hero hall), head to the hero squad menu -> edit squad -> add squad -> here you can create a squad and set a particular squad to defend the turf(set default). By creating the squad, you can use these features on the world map; quick gather, quick battle. Now, come to the hero details. Tap the hero portrait from hero hall menu. Pay attention to the capacity, type, skills, level, and Intel. Capacity – The number of vehicles a hero can lead in the battle. Upgrade the hero to increase its capacity and send more vehicles. On the hero’s profile page menu, head to the gear tab -> if there is a free slot available, tap it and choose the gear -> equip or upgrade. You can upgrade the heroes’ gear using the parts(obtain by defeating the enemies in the battle, completing the events, quests). How To Increase The Hero Level In Madlands Mobile Game? These heroes earn experience points when you send them in the combat. Experience points are required to increase the hero’s level. In the hero’s profile page, you can check its level bar. Tap the + icon next to it and use Hero XP item. This item helps you in leveling up the heroes. You earn this item by defeating the monsters on the world map, by completing the quests, events. 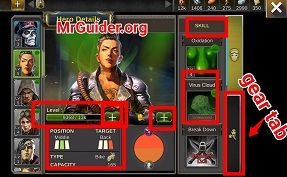 Keep in mind that you can not increase the hero’s level beyond the HQ’s level. For example; HQ Level is 10. In this case, a hero cannot be upgraded to level 11. Rescue or obtain the heroes by obtaining Intel. Intel can be purchased using the silver coins in the store. Manufacturing the vehicles gradually in Madlands Mobile game is your another main job. With the huge vehicle stock available, heroes will attack with full power. For example; a helicopter type hero’s capacity is 500. And you have only 200 helicopters. In this case, that hero will attack with 200 helicopters. So make sure to manufacture the vehicles often to avoid the shortage. Tap the vehicle factory(car/bike/helicopter/truck factory) -> build vehicles -> select the vehicle tier and number of vehicles -> build. You can build high tier vehicles by upgrading the factory. On the main screen, at the bottom-right corner, tap the globe icon to head to the world map. From the world map, you can gather the resources; metal, oil, and more items by defeating the monster camps, looting the unreserved resources points, and raiding the real players’ base. On the world map screen, at the bottom-left, tap the search icon -> from the side menu tabs, you can switch to camps, resources points, or raiders. Simply tap to go there and choose the action; gather/quick-gather, battle/quick-battle. If you have not created a squad, then on the heroes selection screen, tap the left side of the screen to choose the heroes. If you have created the squad, then choose the quick feature(quick gather or quick battle). So this is the Madlands Mobile guide for the rookies. Now, let’s head to the Madlands Mobile tips, cheats & strategy part to learn basic hacks. Production centers such as oil derrick, scrapyard, farm, solar plant produce the resources very slow. And as you know, without resources, you can not upgrade/build the facilities. So it would be better to gather the resources on the world map. Send multiple squads to gather different items. And you can also gather the resources by defeating the raiders/camps/enemies. Sometimes, upon defeating the enemy camp or monster base, you get speed-ups. These speed-ups items help you in finishing the construction. Make sure to gather as much as you can. And for more rewards, raid the enemy camps. All the resources produced or gathered by you can be looted by other players(if they get successful in raid). In the research lab -> economy -> research the “protected” technologies to protect the resources. Make sure to upgrade it to protect more resources. Make sure to create at least one squad(five heroes) to defend the turf from enemies. Head to the hero hall menu -> go to the second tab(right-side menu) -> at the top-left corner, choose edit squad -> add a squad(choose five best heroes; defenders, attackers) to set it as the default defender. Additionally, in the research lab, research on defense technologies. Heor’s skill, gear level impacts a lot in the battle. If you want to increase the attack power of heroes, then make sure to upgrade their level, skills, gears. Additionally, in the research lab, pay attention to the heroes technologies to improve heroes. We would strongly recommend you to pay attention to the events. Madlands Mobile game runs event periodically and allows the players to earn rich quality items for free. You can earn boosters(for example; protection booster can protect all the resources from enemies for a certain amount of time, parts, hero XP, and more). On the main screen of the game, at the bottom-right corner, just above the globe icon, tap the trophy icon to check the ongoing events. Complete the objectives in the events to earn points. Earn as much as you can to get better rewards. You can earn gold by completing simple goals. Just above the globe icon and trophy icon, tap the skull icon to check the goals. Complete these goals to get gold for free. On the main screen, at the top-right corner, tap the golden box icon -> buy the loot boxes to obtain the Intel. By joining the alliance, you can trade with other members and earn alliance currency. Use this currency to buy items such as teleport ticket, rename commander card, speed-ups, and much more.